Most of my blog posts have been about the interesting things people do on the train. This is the first in a series of however many I come up with, exploring the strange things people bring on the train. I'm pleased to include a story about myself in this category. A shopping bag full of extension cords. I was sitting in a three-seater by the window. A man sat down in the aisle seat, and put his huge shopping bag down in the middle seat. Being the curious (nosy) person I am, I peered into the bag. He was transporting extension cords. There must have been 50 in that bag. Who carries a big bag of extension cords on the train? What was he doing with them? I don’t know the story, but here are some possibilities. He lives in an apartment building, and his power was shut off for lack of bill payment. He's running all his appliances to the hallway power outlet (I know someone who did this). He has an electric car, but no time to charge it. He's going to daisy chain the cords so he can drive without unplugging. He was a mule for the seamy extension cord underworld and black market, full of intrigue, exotic people, double crossing, and backstabbing. Large stuffed animals. This is the one about me. A company I once worked for had a carnival holiday party, with games and prizes. There was even an employee dunk tank. This company was serious about parties. I won a couple of very large stuffed animals. Each was a Scooby-Doo about four feet tall. I couldn't possibly abandon prizes my kids would love. Car service was available to get home, but there was a two-hour wait. I decided to take the train. I figured it was after midnight on a Thursday and there would be no problem putting the stuffed animals in the seat against the window. I didn't realize there was a Ranger game that night. For those of you who don't live in the New York area, the Rangers play at Madison Square Garden, which is right above the Long Island Rail Road terminal at Penn Station. 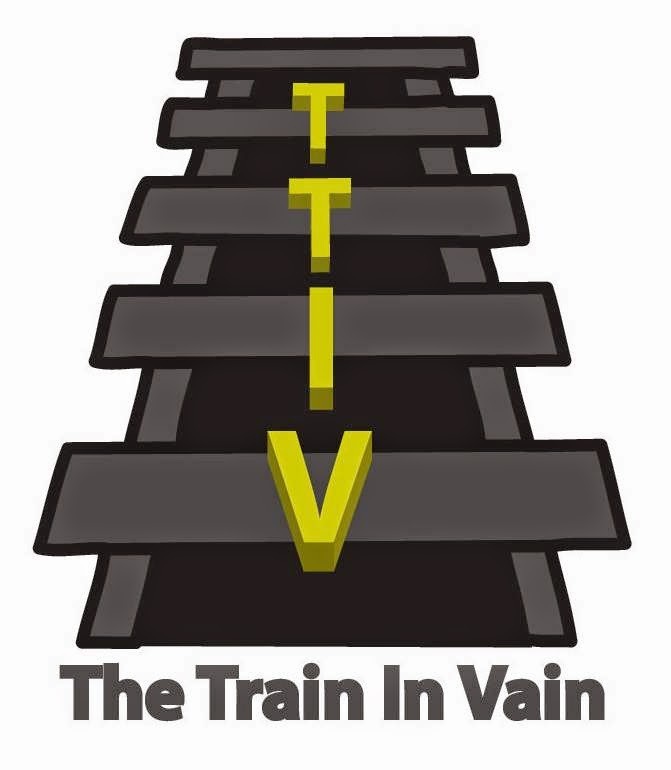 Many Ranger fans attend games, do a lot of drinking, and then get on the train home. A Ranger game ended earlier that evening, and a crew of rowdy guys in Ranger jerseys got on my train. Several saw my very large stuffed animals, and soon there was a small crowd around me. They peppered me with questions about how I got them. These guys were really interested, as the conversation went on for a while. After they got the information they needed, they went back to being rowdy amongst themselves. Large live animals. Blind folks take the train with guide dogs all the time. Service animals are not unusual. But recently, a woman came on with a golden retriever puppy. No pet carrier, just the lady and her dog on a leash. This isn’t allowed, but you know what? The puppy was so well behaved. That dog made everyone smile the whole way home. People played with the dog and several of us had good conversation for the entire ride. 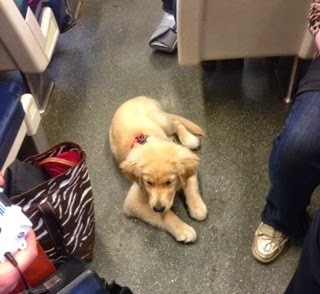 Here's the puppy that improved everyone's commute. I may drop a note in the Long Island Rail Road suggestion box proposing they provide a 4 month old golden retriever in each train car to improve commuter morale. And maybe some Scooby-Doo lamps we could plug in with extension cords.